Many people have a perception of scientists as white-coated individuals hunched over at a lab bench performing experiments. They are doing experimental science which include the testing of hypotheses and determining which ones are supported and which should be discarded. Others scientists are imagined as collecting observational data using telescopes to describe distant planets and stars, or collecting rocks and fossils. They are drawing on those observations to make hypotheses about the cause of what they see but rarely are able to test their observations directly in a controlled environment. These perceptions whether based in reality or not have led to many misconceptions regarding the validity and strength of conclusions from these forms of scientific inquiry. Why the concern about understanding how science is done? 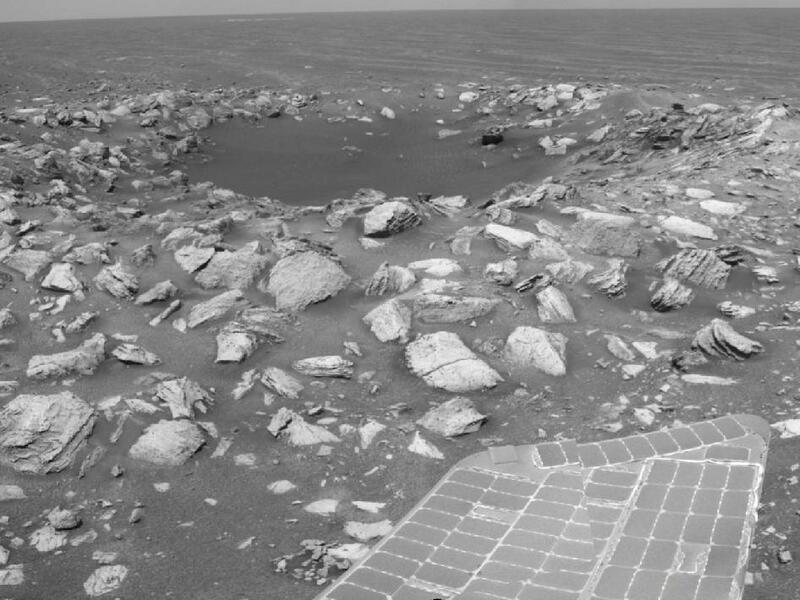 Observational science in action: A crater such as this "young" 30 foot wide crater on mars as seen by the opportunity rover. We can only observe this crater which is the result of a singular event in history. No one saw this crater being formed and we can not go back in time and see its creation and yet we can use many forms of circumstantial evidence, much of which is based on testable hypotheses, to deduce with high likelihood the causative agent of that crater and even to estimate its age. Compared to the many hundreds of experimental tests on the effects of most any pharmaceutical drug on a human the confidence in the results and their predictive power would unlikely be nearly as convincing as the explanation of this singular event in history for which direct observation is impossible. On a nearly daily basis in the creation literature there are claims made that both evolution and the old age of the earth are not valid scientific theories because they are not testable. Rather, such “historical” and “observational” forms of science are placed in a category of science which they have chosen to call “origins” science. This is a term devised in 1987 by creationists in an attempt to compartmentalize science into something they called origins and operational science the latter of which is also a made-up term for science of testing and verifying ideas in the present. Philosophers and historians of science have long recognized that there fields of scientific inquiry do differ in their means of operation and usually divide scientific investigation into tow broad categories called experimental and observational science. Other names have been used for observational science including historical, forensic or descriptive sciences. The distinctions usually come down to methods by with hypotheses and predictions of those hypotheses can be tested. I won’t deny that the issues are complex with respect to the question of the testability of a hypothesis but it is still quite shocking at times how many misconceptions exist about the validity of the historical sciences (areas within geology, biology, archaeology, astronomy). Let me demonstrate the magnitude of the problem with just one quote. This quote comes from Answers in Genesis on April 8th 2012 in their “news of note” section (http://www.answersingenesis.org/articles/2012/04/07/news-to-note-04072012) were we see the common use of the distinction of origins and observational science. Many in the church are “wowed” by the rhetoric that science has proven molecules-to-man evolution occurred over millions of years. They fail to grasp the galactic difference between observational science and origins science. The scientific method requires hypotheses be subjected to repeatable observable testing. Evolutionary and long-age conclusions exist in the realm of origins science and are based on unverifiable assumptions about the past. Observational science, not origins science, is the basis for the wonderful medical and technological discoveries that bless our lives. There is no conflict between observational science and the Bible. This quote lays out the central tenet of origins science quite clearly. Anything that happened in the past are to be suspect because we can’t go back and verify the exact conditions under which those events happened. I’ll just say that this tenet is false but I won’t spend the time here to show why. What is even more striking to me is that the AIG author here can’t even keep their terms straight. This is a bunch of nice-sounding jargon with very little meaning. They contrast “observational science” with “origins science.” Apparently they are using a different dictionary to define their words. Observational science is often a near synonym for historical sciences and so where is the contrast? I think the author meant to say experimental science or more probably meant to use the creation science created term “operational” science. If they meant to say observational then they are just redefining a term for their own convenience. You can see how quickly all this becomes very confusing because there are so many terms. Clearly the author here is quite confused as well. The key, though, is that they are trying to say that somehow historical science is no good because it isn’t testable. This claim is made all the time but the philosophical underpinnings of this claim are quite nebulous other than references back to Popper and the concept of falsification. That theory has been discussed at great length in the literature but the creation science literature seems to have chosen to ignore that discussion. There is a great body of literature about nature and validity of the historical sciences that I expect (based on the “evidence” of their writing) that YECs have not bothered to familiarize themselves with it. Below I list a sampling of what I think are good resources for understanding this complex but very important topic. I won’t say that these papers are easy to read but the issues involved in how the result of scientific inquiry are to be interpreted are not simple. For those who presume to speak as scientists and experts in their field and have influence over the minds of the lay person it is incumbent on them to know the literature and not to be victims of misconceptions themselves. The folks at Answers in Genesis sorely need to spend more time learning the basics of science before the preach to others about what it is and isn’t. *Historical science, experimental science, and the scientific method. Carol Cleland 2001. Geology 29: 987-990. – The link is to a PDF of this article. This is the most accessible scholarly article that is a must read for understanding the current state of thinking of how historical and experimental sciences are similar and different. **Methodological and Epistemic Differences between Historical Science and Experimental Science. Carol Cleland. Philosophy of Science 69 (2002). 474-496. -This link is to a PDF of this article. This article is an expansion of the one above the delves into the philosophical questions a bit deeper. I have regularly assigned this article as required reading for most doctora students for whom I sit on their dissertation committees. For those students written preliminary exams I have then explore and express their opinions about the questions and hypotheses raised in the article and have them apply then to their own research. **Prediction and Explanation in Historical Natural Science Carol Cleland British Journal Philosophy and Science 2011: 1-32. Unfortunately this is just a link to the abstract for most readers but the article is a must read if for those who seriously want explore teh philosophical underpinnings of the historical sciences. This is deeper and more recent exploration of Cleland’s argument for the use of historical sciences and contains a better description of an argument from the so-called Asymmetry of Overdetermination aspect of history. This article for me will replace the other one by Cleland that I have students read. ***Testing times: regularities in the historical sciences. Ben Jeffares, 2008. Studies in History, and Philosophy of Biological and Biomedical Sciences. 39: 469-475. This is a link to the abstract. Many of you may not have access to the full article. Jeffares, explores some aspects of Cleland’s “smoking gun” evidence a bit further. ***Historical Reconstruction: Gaining Epistemic Access to the Deep Past by Patrick Forber, Eric Griffith, 2011, in Philosophy and Theory in Biology 3:e203. This is the link to the html version but there is a PDF link at this site as well. More technical than the others, Forber and Griffith take a different approach using “consilience of multiple line of evidence” rather than the search for the “smoking gun” for support. These critiques of origins science are quite accessible to the non-scientists and present a good overview of the nature of science. Reformed Academic blog post: Origin Science and Operation Science – A very accessible critique of “origins” science. Reformed Academic blog post: More on Origin and Operation Science – Further exploration of the question of whether this is a real distinction between “origins’ science and any other science. I think it probably suits them not to do this. That way they can ignore or ‘re-interpret using scripture’ inconvenient evidence. I’ve sent many emails about stuff like that shown above displayed on the AiG website. But they have never engaged with the issues I have raised. I enjoyed your article. As a supporter of Answers in Genesis, I would like to provide you with my perspective on this topic of “observational vs. historical” science as described by AIG. Let me break it down: You assert AIG is redefining observational science for their convenience; I would have to agree. Experimental science would be the more proper term for what they are defining as observational science. You may ask, so why this linguistic license with the term? Since their audience are not scientists, to describe the former as “experimental” would be rather confusing as both types of science perform experiments. It appears to me AIG has chosen to use the term “observational” to get their point across to those in their audience since it is science in the “here and now” and can be observed. This is clearer and easier to understand for the layman not familiar with the terms, wouldn’t you agree? In my mind this is bringing an expanded meaning to the term, and I don’t have a problem with it although you certainly may. Language is not static; it is creative and changes with the times to accommodate changes in culture, understanding and times. And let’s face it; we are beginning to see the monolithic lock on “origins” science by naturalist cracking. This is change. Regarding “origins” science or “historical” science, it seems to me, AIG uses both of these terms to describe science which is based on the circumstantial evidence, those theories which can not be tested in the here and now. Once again I have no problem with their use of these terms. Although they take linguistic liberties, in my opinion, with these terms, they do not hide their ideas, purpose or mission. They are very clear, direct and upfront about their ideas and even a cursory reading of their web page makes crystal clear their positions. Therefore I don’t see it as a problem. Here’s the bottom line. Theories about the origins of the earth and the universe, whether they are from your mind and research, the bible, or any other source are just that: theories unable to be sufficiently proved by the scientific method. The inability of all these theories to actually discover the truth about the past does not effect the sciences in the here and now, technological advancement, or any other “in the present” scientific endeavors. Natural or supernatural origins theories are what I consider a “dual checkmate”, so to speak; can’t be proved either way. I hope this has provided some understanding on the nomenclature used by some creationist scientists. Thanks for pointing this out. That is a good quote and an excellent observation. I thought that Bill Nye should not have talked about technology so much as YECs can obviously make contributions to technology. Ham was able to use technology as equal to science to muddle the whole discussion. I like the application vs tested truth/theories comparison here. I will definitely use this in the future.